Improved search experience for content, groups, and members–In this release, we added the ability to search and filter groups. Now you can search for organization groups and public groups. We also enhanced the search experience by combining the search for content, groups, and members into one. You can narrow your search results by using filters specific for groups, content, and members. The following screenshots illustrate the search results for the same parameter for the multiple sections. 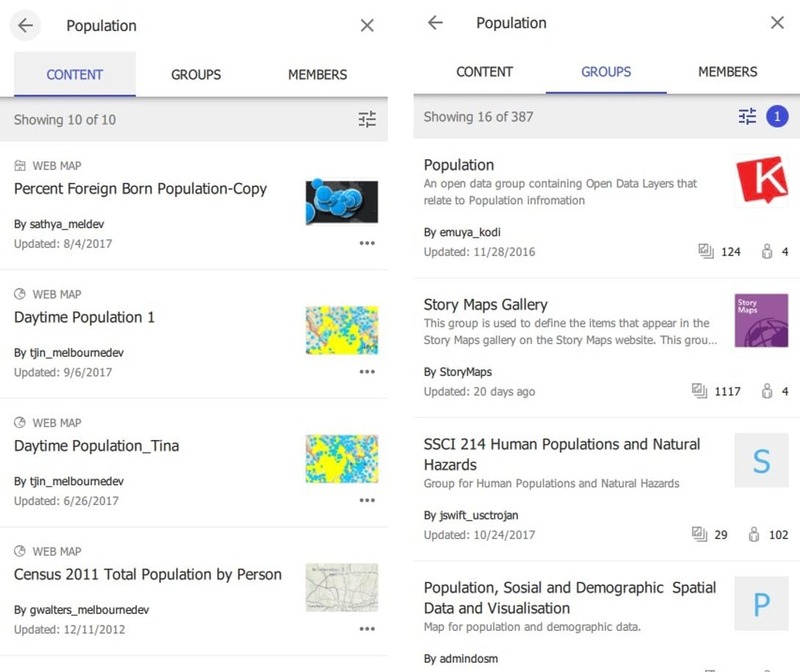 You can swipe between sections to see the search results for content, groups, or members. In the previous release, we added the ability to view group membership requests. In this release, we further enhanced this feature by integrating group membership requests with the notifications that you’re already used to. 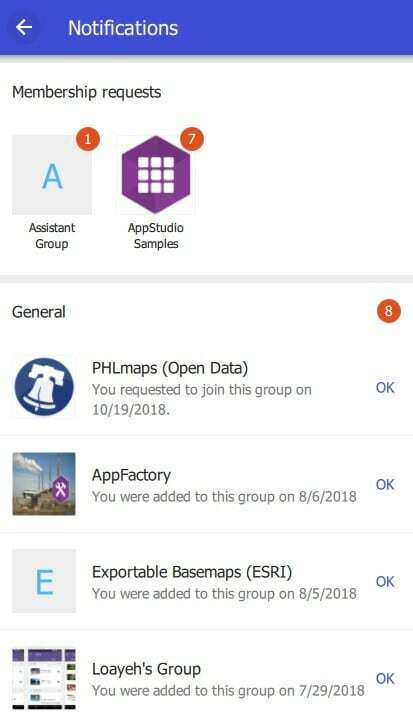 In other words, you can now view any pending group membership requests as a part of your ArcGIS Notifications. The example below shows pending membership requests for two groups as well as general notifications. An icon indicates the total number of notifications. Similar to a content item, you can now edit the title, summary, and tags for your groups. To edit a group’s title, summary, or tags, navigate to the group overview page and tap the respective edit icon. The edit icon only appears if you are the group owner or group manager (or if you have administrative privileges). Tapping the edit icon next to the tags section opens the manage tags page. You can add, delete, or edit one or more tags—similar to editing tags for content items. You can add one or more tags at the same time by separating them with a comma. You can now enable delete protection for groups that you own (or other groups in the organization, if you have administrative privileges). Enabling delete protection prevents a group from being deleted by mistake. Attempts to delete the group will display a message that the group has delete protection enabled and cannot be deleted. You can now sort and filter the list of groups on the My Groups and Organization group’s pages. For example, you can sort My groups by title and date and filter the list to show only groups with new membership requests. You can also filter the list based on whether or not you own the group. 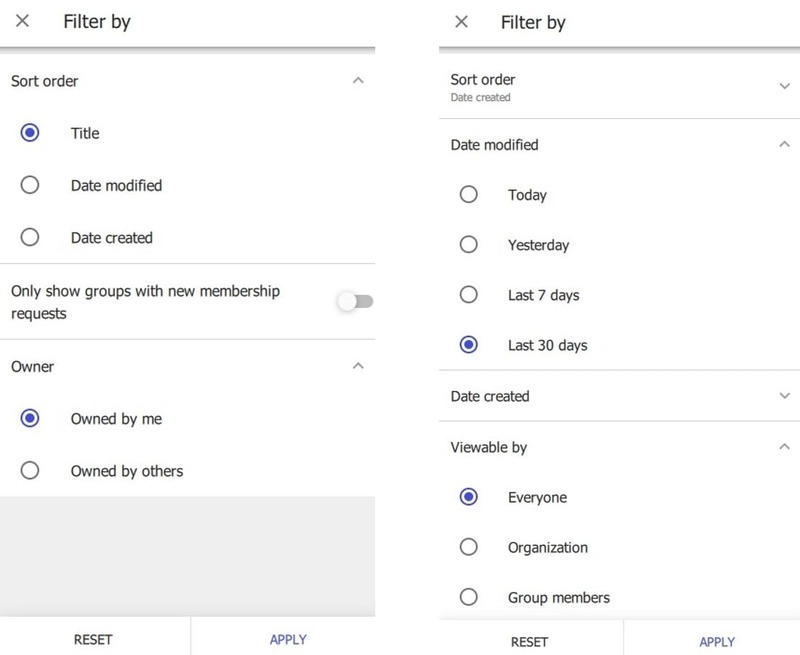 Similarly, for organization groups, you can sort and filter by date and show a list of groups based on who can find the group (everyone, organization members, or group members only). We are always working to improve the app for a better user experience. This release provides new features requested by organization members, as well as other enhancements and bug fixes. Please continue to send your feedback via Esri Support or GeoNet community. We’d like to hear from all sides on what would make the app even more useful for you and your organization. Comments or questions? Join the discussion on GeoNet. 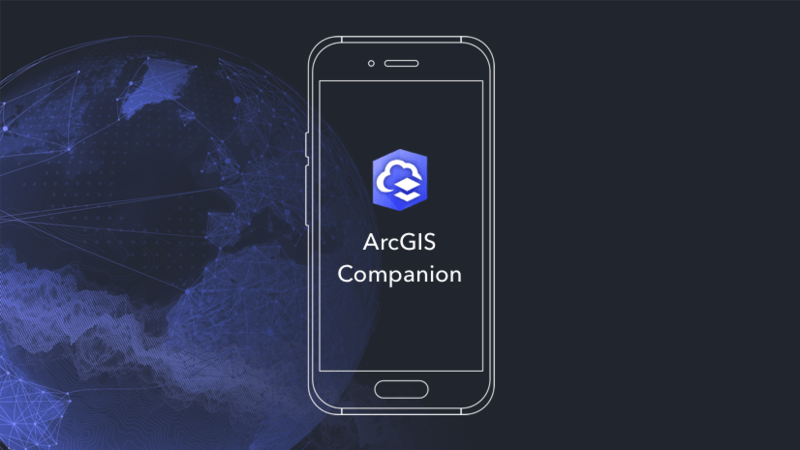 ArcGIS Companion, a native mobile app created to complement your ArcGIS organization. It’s simple, intuitive, well crafted and ready to help with your ArcGIS organization tasks. Get started by downloading the app to your phone or tablet and sign in with your ArcGIS organizational account. Group Engineer Manager and Software Development Lead. Story Maps + AppStudio + Survey123 + ArcGIS Companion + Esri Labs. 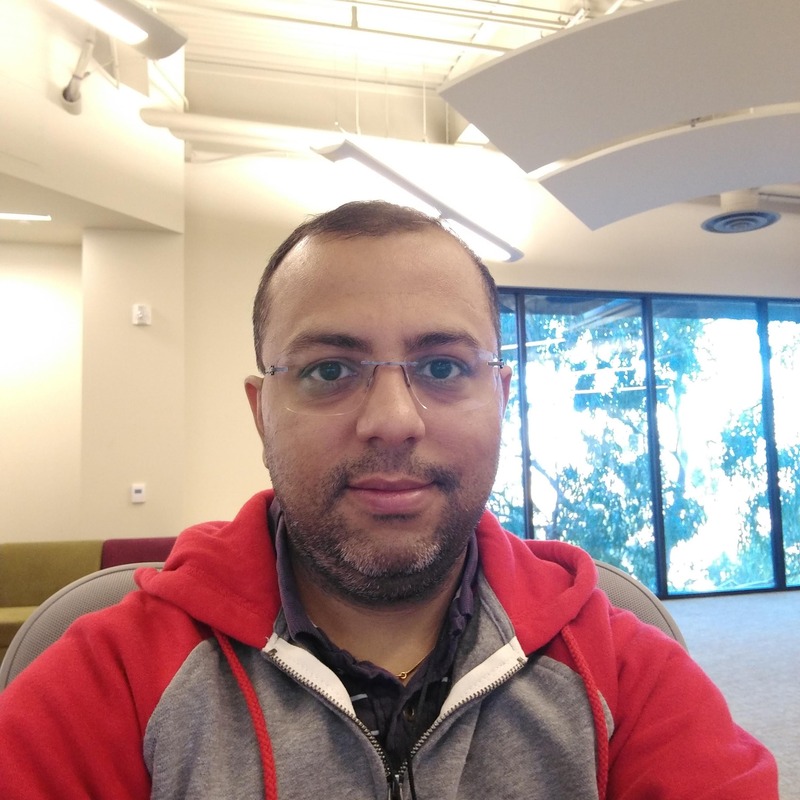 Sathya Prasad has been with Esri for 14 years and currently works in the Software Development group. Sathya has spent more than fifteen years in the intersection of software and GIS industry and has extensive experience with Mobile, Web, Social, Spatial and Cloud technologies. Sathya enjoys solving hard problems especially in the GIS and spatial world and coming up with very creative solutions. 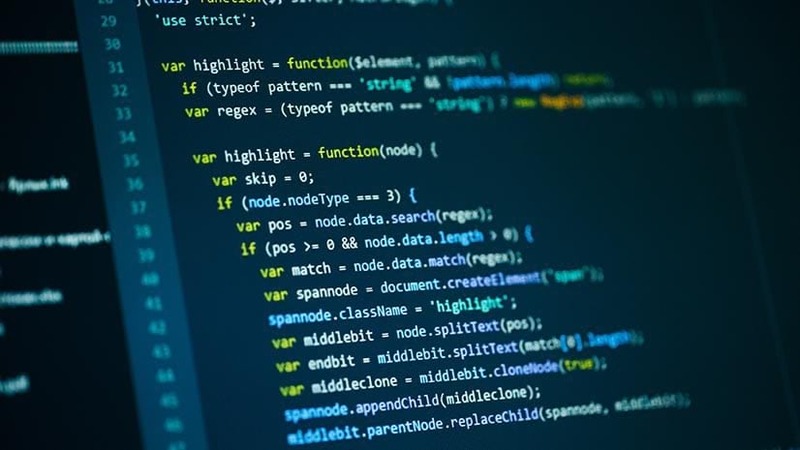 His background is in both computer science and business education. Lead Product Engineer working with AppStudio for ArcGIS + ArcGIS Companion. Has been working with Esri for 10+ years. Enjoys working with ArcGIS Runtime and Mobile app development while working on real world GIS & spatial challenges. List of top 10 things any ArcGIS organization user should try using the new ArcGIS companion mobile app. New folder view, Add/Edit tags, Content settings, Delete protection, Invite users to org, Search improvements, and more. Improved search experience. Notifications now include group membership requests. Ability to edit group metadata. New sort and filter options. 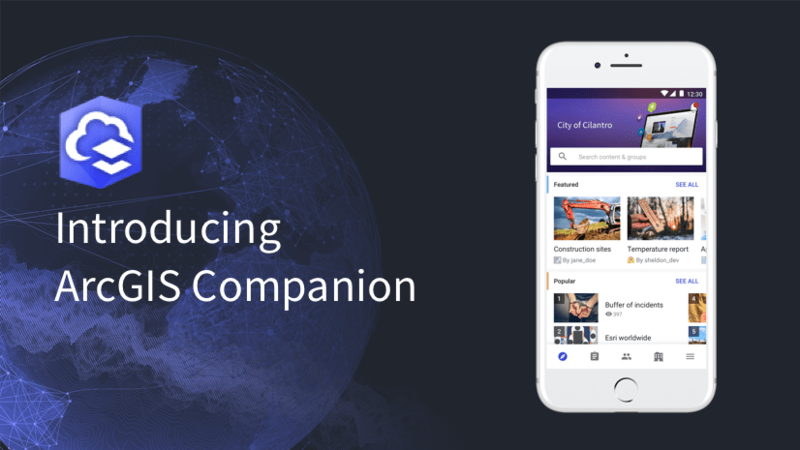 ArcGIS Companion, a new mobile app for iOS and Android. Tap into your ArcGIS organization anytime, anywhere. New user types - manage and edit, content filters, group filters, member filters.